Do those three words make any of you cringe? Unlike the implications of the joke, I don’t think the actual act of cooking is a problem, but I do get weary of deciding what to cook. There are just so many days that I can serve the same staple meals before I get bored. I spend a good part of each day chanting “what will I make for dinner.” Frankly, it wouldn’t be such a problem if it didn’t spoil the zen of my afternoon knitting. Most days, I don’t have an answer by 5:00 pm and I stare in the refrigerator and pantry for long minutes searching for inspiration. But as I was making pasta (again! ), I had the brilliant idea to set up a competition on my blog for easy, tasty recipes! Here’s how it works: You type the recipe for a favorite main dish in the comment box and I’ll send you an autographed copy (or not autographed if you prefer—the resale value is probably higher if I don’t deface it) of the Ann Budd book of your choice (see http://www.annbuddknits.com/ for a list of my books). If more than one person responds, I’ll put the names in a hat and draw a winner. Winner will be notified March 5, 2010, at which time I’ll ask for your mailing address. Important Note: The following ingredients are cause for disqualification: anchovies, brussel sprouts, any animal organ (ick). I’ve managed to convince my family that because of all the time I spend knitting and at the computer, I must have regular massages. So about once a month, I spend a blessed hour and a half with Adele of the magic hands (Adele is also a knitter, which probably explains her talented hands). I had a glorious session yesterday. Imagine—it’s cold, snowy, and icy outside and I get to climb onto a heated massage table and mentally check out while Adele works her magic. Some of what she does—like kneading my muscles until they scream uncle—makes sense to me. But other times—like when she holds my ankles for about 5 minutes—is a mystery. In the end, though, I always feel great so I believe that Adele knows what she’s doing. And today I can almost touch my shoulders to my ears! After that relaxing session, I picked up my Boxleaf shawl (pattern from Anne Hanson; yarn from Briar Rose Fibers) and worked several pattern repeats without making any errors! Hmmm, I bet that I could finish this shawl tonight if I had another massage today. My plan is to keep the basket in plain view to nag me until I get around to it. I wonder how many new pairs of socks I’ll knit in the meantime. Most Satrudays I meet some friends at a local bookstore for a cup of coffee and a couple of hours of knitting. Naturally, we gather in the crafts section of the bookstore where people are less intimidated by a group of middle-aged women with pointy needles. 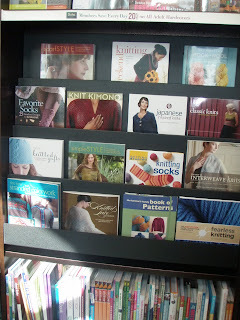 This particular bookstore has a nice section of knitting books, including many that I authored. In a brief moment of shamless self promotion, I rearranged the display shelf to include as many of my titles as possible. Just to prove that I’m not a hopeless spoiled brat, I put things back before I left. 1. I saw Julie & Julia (twice—I just can’t get enough of Meryl Streep) and I know that you don’t have to be a genius to start a blog, but it sure helps to know one. I couldn’t have managed without the help of Anne and Lori, who tried to explain things like domains, hosts, search engines, and links, and then did the work for me when I failed to grasp the nuances (another reason I’m a spoiled brat). 2. It is best to proofread before posting. And better to proofread two or three times. But if I don’t, it’s nice to know that mistakes can be fixed. Thank you for pointing out the major error in My Favorite Formula calculation, and thank you for not pointing out my typos. 3. Photos are essential, which means that a digital camera is necessary. I’ve learned that a digital camera is more complicated than it looks. I’ve also learned that there is much more to taking good photos than aiming and shooting, although that’s all I’m capable of at present. I’m quite open to tips and suggestions. 4. A blog can take over your life. I now think in terms of blogability, I carry my camera with me wherever I go, I knit even more than before (if that’s possible) so that I have new projects to photograph, and I wake up in the middle of the night composing posts. My family and day job have definitely suffered. 5. Blogging is loads more fun than I expected. I love reading the comments and getting feedback. 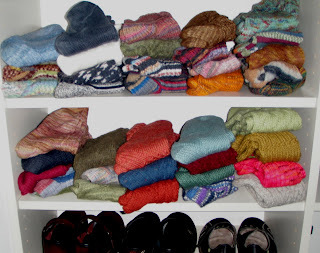 I love discovering how much I have in common with so many other knitters. I love connecting with people I’ve never met. For someone who is a hermit at heart, this is huge! I think that’s cause to celebrate. 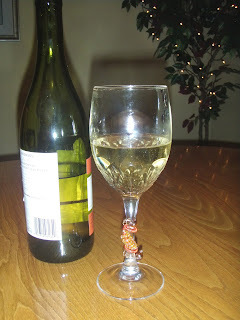 After many false starts (and more than a little help from my friends), I finally added links to my blog page. You’ll find them at the right-hand edge of your screen. One is for my website, the other is for a downloadable pdf of My Favorite Formula—thanks to Barklay A. Dunn of Baba Black Sheep Yarns for putting this together. Maybe I’m ready for the twenty-first century after all! When does a work in progress (WIP) become an unfinished object (UFO)? I hesitate to give any of my knitting projects UFO status. A UFO sounds so, well, evasive. I only wear handknitted socks. 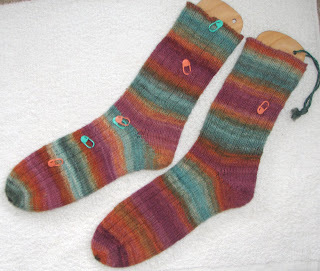 About 10 year ago I knitted my first pair of handknitted socks. 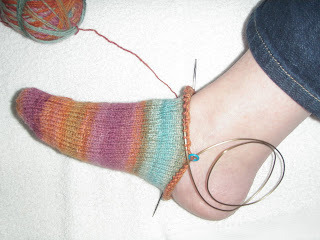 Like many new sock knitters, I was fascinated by the way the heel magically takes shape. And I loved the way they fit my feet without binding at the top of the leg. So much more comfortable than the ones I bought at the department store! So I knit another pair. And I was equally fascinated by the heel turn and the comfortable fit. 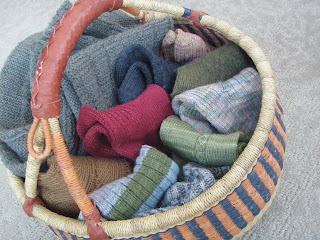 And I discovered that if wool socks are left to air for a day or two, they don’t need to be washed after each wearing. How about that?—less laundry and more comfort. So I knit another pair, then another, then another, then, well, you get the idea. Socks quickly became my favorite knitting project. They are portable, they are quick to knit, and there are hundreds of great sock yarns to choose from (superwash wool can be machine washed along with jeans, then left to air dry). I find that although I’m conservative in my dress (mostly mud, olive, and burgundy tones), I will happily wear any color or pattern on my feet. And I truly love working with double-pointed needles. So whenever I need a portable project or one that doesn’t require much concentration (like when I travel or watch movies or knit with friends), I knit a pair of socks. Even though I give away many pairs as gifts, I make sure that I always have enough for myself. When I take a break from writing and editing today, I plan to cast on a pair of socks with this beautiful 100% superwash merino (notice the bright yellow!) 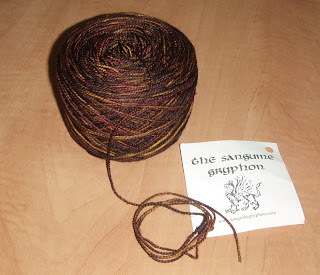 from The Sanquine Gryphon (www.sanguinegryphon.com). 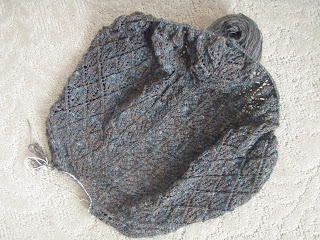 Can you believe that in all the years I’ve been knitting, I have knitted only one shawl (and that was under duress for a staff project for Fall 1998 issue of Interweave Knits). Truth be told, I never thought of myself as a shawl person. But after shivering at my desk and at workshops and during knitting groups while my friends were snuggly wrapped in shawls, I decided that I must be missing something good. 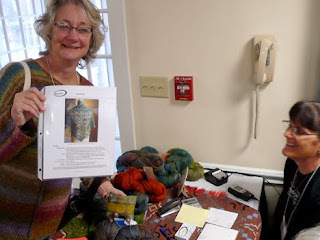 So, when I attended Clara Parkes’ Knitter’s Review Retreat last fall, I challenged myself to finally knit myself(!) a shawl. I found the perfect yarn from Briar Rose (www.briarosefibers.net)—a luscious laceweight blend of 50% merino and 50% tencel called sea pearl—and the perfect pattern—Anne Hanson’s (www.knitspot.com) Boxleaf Triangle shawl. To mark the momentous occasion, Anne Hanson took a photo of me making the purchase (do I really look that awful?). There was no going back. When I got home, I lovingly tucked the yarn and pattern in my stash while I finished (and started) other projects. But I’ve been nursing a cold (read that making excuses to do anything but sleep as much as possible) for the past few days and concluded that now was the time to start. Unfortunately, my head wasn’t clear enough to read lace charts and I had several false starts. But I’m happy to say that I’ve worked through a couple of pattern repeats and am most excited about the prospect. Why are there two different colored tips on my circular needles, you ask? Many years ago I discovered that because I knit much tighter than I purl, my stitches are more uniform if I use a size larger needle for the knit rows. My set of Boye interchangeable needles lets me put together unmatched circular needles—in this case, size 7 (green) for right-side knit rows and size 6 (red) for wrong-side purl rows. Perfect! When Abby Franquemont (http://www.abbysyarns.com/) gave me two skeins of her precious handspun yarn to make a pair of socks last fall, I vowed to knit them right away. I did wind it into balls, but, well, one thing led to another and before I knew it, several months had passed. When I photographed the yarn last week for a blog post (Why I’m a Spoiled Brat—#2), I decided it was high time to get started. 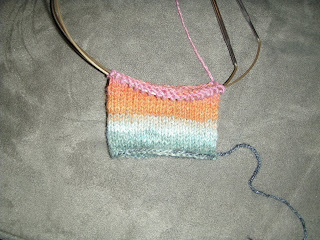 Like a good knitter, I knitted a swatch to determine the needle size. I started on size U.S 5, but the fabric was too loose for my liking. So I swtiched to size U.S. 3 needles for a nice snug gauge of 7 stitches per inch. Because I knew that I’d never get more of the same yarn and because I wanted to be sure not to run out, I decided to knit these socks from the toe up. I followed the general pattern for toe-up socks that I wrote for the Beyond the Basics article in the Summer 2007 issue of Interweave Knits (Working Socks from the Toe Up; pages 24 to 29). I worked my favorite k3, p1 rib across the instep, then tried on the sock to tell when it was time to start the short-row heel. 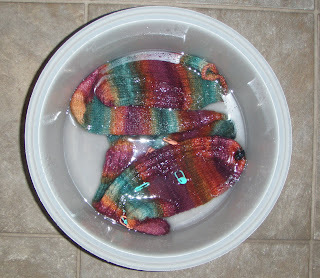 To block, I soaked the socks for 20 mintues. Then I spun out the excess water on the spin cycle of my washing machine and put the socks on blockers to dry. I was so worried that there might not be enough yarn that I left very little tail when casting on. It wasn’t until the first sock was nearly done that I realized that the bit of charcoal yarn at the tips of the toe must have the been the leader yarn Abby used when she began spinning the yarn—it doesn’t appear anywhere else in the skein. It’s a nice reminder that this is handspun yarn. Although the color patterning is different for each foot, it is remarkably similar along the legs. How did Abby manage that?! 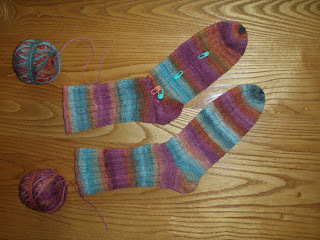 I’m teaching a workshop on knitting socks from the toe up this weekend. I’ll keep this pair pristine to use as an example, but then I plan to wear them until they wear out.